A few weeks ago, I published a post with a recording of the Cuban numbers station HM01, a “Hybrid Mode” numbers station which interchangeably broadcasts both voice and a digital mode called RDFT with each transmission. I had suggested using an application called “DIGTRX” to decode the data bursts. Imagine that a spy numbers station is using an application you, yourself, authored to send coded messages. What are the odds? This apparently happened to Roland, when he discovered that HM01 was, in fact, using his application DIGTRX. What?!? Actually, it makes sense to me that numbers stations would use DIGTRX. After all, it’s open source. Operatives in the field can download the application without raising awareness. If it were a proprietary application, either commercially or of their own design, it would add to the complication of downloading and using it (on both ends). As you’ll read in Roland’s tutorial, HM01 has built in robust redundancies by using RDFT and DIGTRX. Very interesting. This entry was posted in Articles, How To, Numbers Stations, Shortwave Radio and tagged Cuban Spy Numbers Station, Decoding Cuban Spy Numbers Station, Decoding HM01, Decoding RDFT, DIGTRX, RDFT, Roland on February 27, 2013 by Thomas. What was the frequency and time? I have been trying to get into finding these stations and have a great digital setup. This has me really interested. 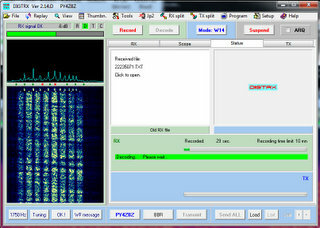 Try listening to 5,855 kHz around 10:00 UTC. HM01 isn’t there every day, but it there quite often.